As Dragoneer leads the largest furry website, the incident became known all over the fandom. It only grew when, on 30 October, Sciggles tweeted that Uncle Kage, chairman of Anthrocon, had emailed her and Dragoneer, telling them to stop speaking out about the Dorsai's conduct. I do not know what beef you have with the Dorsai, but I would like you to stop baiting them, and I want the public attacks on them to stop. You are a professional and you run a convention yourself; you should know better. [... Inciting division] is not good for the fandom and brings nothing but heartache to both sides. [...] Deliberately adding to the pressures other organizers have to endure is very, very mean. Anthrocon and the Dorsai – brothers in arms? 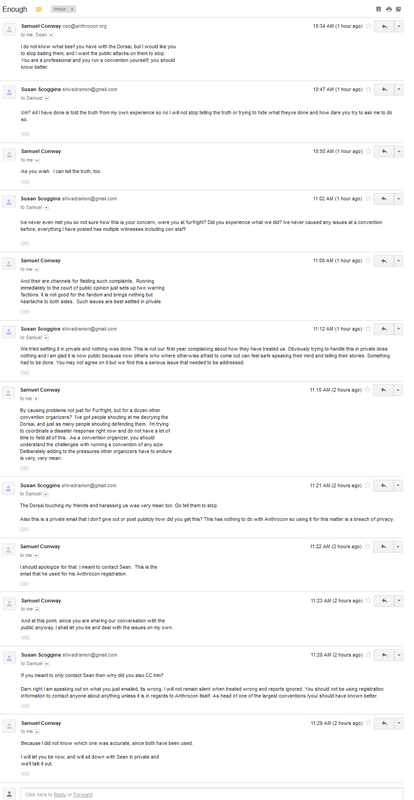 One possible motivation for Kage's email is that the Dorsai serve as security for Anthrocon and other furry events, and the public backlash may damage these relationships. While some conventions use their own security staff, state law can require a third-party security outfit for gatherings above a certain size, and hiring professionals would be very expensive. However, the relationship between Anthrocon and the Dorsai is less "arm's length", and more "brothers-in-arms". Anthrocon staff have been invited to several instances of the "Dorsai Thing" (an annual "relaxacon" for the Dorsai and their friends), back to at least 2005. Similarly, while the Dorsai traditionally recruited from sci-fi fandom, several AC staff have gone through the process of joining the Dorsai. Moreover, next year's Dorsai Thing is being organized by furries; the convention committee consists of Uncle Kage as hotel liason, Anthrocon operations lead Giza (also a Dorsai member), Anthrocon video game leads Kiric and turtyl, and Furry Connection North publications director and Anthrocon video game staffer Omnibahumut. Kage complained that Dragoneer's journal was not going through the proper channels, was creating two opposing sides and should have been resolved privately. According to Dragoneer, the issues have been brought up privately before and nothing was done about it. Aside from being accused of interfering in other people's business, Kage was criticised by Sciggles, and others, for violating their privacy by using email addresses from Anthrocon's registration database. Kage later apologized for contacting Sciggles by mistake. No statement has been made on the FurFight website, although dealers' room staffer SlideWolf claimed not to have heard any complaints while working with co-chair K'gra during the event. The Dorsai Irregulars are an outfit of volunteer security staff, presented as misfits who win by stealth and trickery within a group of honourable mercenaries in the Childe Cycle of s-f novels. Formed in 1974 at the 32nd WorldCon – reportedly after friction with non-fandom security staff who were accused of acting insensitively, and failing to notice a thief walking out of Torcon II's art show with a Frank Kelly Freas painting after buying a lower-value work – they have provided a variety of security-related services as the DI (and as the Klingon Diplomatic Corps at Star Trek events) for almost four decades. While amateurs, they do train in means of restraint, de-escalation techniques, and filk music at their annual retreat, the "Dorsai Thing". Have no fears of "overbearing Stormtroopers" enraging your confolk. Uniforms and attitudes went out with the Seventies. We don't carry weapons (okay, maybe the occasional water gun and maybe some candy whips, but that's it! ), we don't wear jackboots (okay, my mother does, but that's it! Really!) and we don't manhandle fen. Our berets, belt buckles and shirts, (bearing a distinctive logo designed for us by Kelly Freas), are intended to enhance our visibility and foster a sense of teamwork and fellowship. Irregulars are longtime, well-known fans recruited for their ability to work well together and cope flexibly with the individuality that characterizes fandom. Many Dorsai are expected to attend Midwest FurFest 2012 informally, but their next contract is MAGFest 11. I want to acknowledge and thank GreenReaper for the changes he's made. The 'Who are the Dorsai' part was all his and the box on the relationship between the Dorsai and Anthrocon is a more detailed expansion of what I had only had as one or two lines. Simply put you bring on a few bad apples every year and these bad apples act like cops with a badge. The response is almost exactly the same – an attempt to evoke shame. Alas, not everyone grew up Catholic. Maybe in the past it was "the done thing" for these things to be sorted out in private between drinking buddies. But realistically, what's going to happen when the DI being complained about is your buddy, and leads the crew? You're can't exactly throw them out, can you? The Irregulars are generally smart enough not to say anything, though. If they did screw up, they likely already know, and regret it. The hard part for me when facing a story like this is that I served in AC operations for several years, working alongside the Dorsai. I have no doubt about their leadership's commitment or their crew's enthusiasm. Those I interacted with were genuinely nice people, trying to provide a good service; and for the price - a cramped bed, a stiff drink, and a hot meal at the end - they do, just as most volunteers do. I'll probably see several of them at MFF, and gladly give them a nod and a smile. Now, do I think their relationship with Anthrocon is just a little too cosy, with the chairman raising a glass with its officers, while his protégé wears their beret? Sure. But they might as well enjoy it while they can, because we're getting to the point where it is not tenable for the Dorsai to handle security at Anthrocon. It's simple math: we grow 15% a year, and they don't. 5,000 people might not seem that much, but you don't get all 100 DI showing up at AC; I'd call it perhaps a third of that. Work and family commitments make more impossible. Can a group this size - perhaps half of whom will be on duty at any one time - effectively police 5,000? 7,500? 10,000? If not, can they expand to do so and remain DI? I'm sure this has come up in those "future of the Dorsai" panels. Of course, arguably you don't need the Dorsai stuck guarding doors nowadays (except when everyone else is asleep). But this just means they get harder calls, more of the time – and not everyone is management material. Worse, their most seasoned leadership is approaching retirement, though I imagine it's not the first time they've faced that. Conclusion: the DI will continue to staff furry cons, but maybe not AC. Only a small number of Dorsai - the ones actually wearing the berets - show at FurFright. The majority of security staff is recruited by the Dorsai for the con, and these people are given a Staff badge and an orange shirt. The vast majority of these non-Dorsai security members, although they are instructed by and represent the Dorsai (and FurFright as a whole), are furry volunteers attending the con. Because of its attendance cap FurFright is not expected to grow, but if this is what the Dorsai do at other cons, then they should be able to keep up with Anthrocon's growth for a while longer. They'll just need enough core crew members (actual Dorsai) to manage the security staff. What makes this ironic is that even if FurFright listened to the petition (and it won't, because it's founded on misleading stories and one-sided accounts of a single incident), even if they dropped the Dorsai and stuck with volunteers or found some similar entity to do the same work, we'd have the same furries and the same staff. If anybody noticed a difference they'd be lying to themselves. If a 1500-attendee con hired a PROFESSIONAL security team that would get very expensive, very fast. I'd estimate an average of a $20 hike per paying attendee just to keep the con secured by professionals at all hours. And they'd probably be MUCH harder on attendees than the Dorsai, who respect us as a fellow fandom. A professional security team doesn't know us. The Dorsai were indeed checking the front lobby for badges at the hotel's request, or room keys. They did this for only about 20 minutes. And they were given instructions, as they are every year, to help keep the hotel room noise down. It's better that they take care of it before the hotel starts getting complaints - or worse, the police. It should be noted that Dragoneer and his close buddies have had a grudge against the Dorsai for a very long time. He has feuded with Giza (now a Dorsai member) several times in the past, as old PA-Furry mailing list logs should be able to attest to (if they're still available). It's no surprise to me that Dragoneer complains about them, privately or publicly, every time he encounters one. Hence it's unsurprising yet to find Dragoneer and crew choosing to question the Dorsai's authority and (by Dragoneer's own admittance in his journal entry) disobey them, causing an unsurprising reaction of the Dorsai putting their foot down. And it's unsurprising still that they should make such bold claims that the Dorsai had been exceeding their authority without bothering to ask anybody what the bounds of their authority was. Second: Dragoneer and crew keep repeating that they first took the issue up with con staff who did nothing about it. From their comments on Reddit it's clear they told the Reg Director (Gavin) and Assistant Reg Director (Lucian). Apparently, Gavin either did not have the time to pass this important message to the con chairs before things blew up online, or he did not intend to. According to Dragoneer's journal, "multiple con staffers and some of the directors" told him directly that they could do nothing about it, and (so implied) chose not to escalate the issue to the correct people. Even if Reg handled it correctly I'm not sure if Dragoneer & crew gave them enough time to do so - things blew up immediately after the con, when staff was still packing up and returning home and a hurricane was knocking out half of the grid in the Northeast. I'm hoping that Reg, for their part, had actually intended to do something about the complaints. But, if people have a problem with Security, why did they complain to Registration? If you're on staff (as SilverAutomatic was this year) in that department you can gripe to the Registration team, sure. But the staff of FurFright is much bigger and not as close knit as a tiny con like FA:United. FurFright staff is larger and highly compartmentalized, and I see it operate far more smoothly and efficiently compared to many other cons as a result. You would think that people with experience running a convention (as you'd expect Dragoneer & crew to have by now, with FA:United, as everyone involved is in fact an FA:United staffer) would understand how to make a complaint through the proper channels. If someone has a problem with a security volunteer, take up a complaint with the head of security. If someone has a problem with the head of security, take up a complaint with the Con Chair. If you don't know WHO to complain to, that's what the Information Desk is for, where active Con Ops staff is happy to help you. It's Con Ops' job to take your complaint seriously and pass it on to the correct people who can address the problem. Registration should have an obligation to pass the information on or at least guide the offended to the correct place to complain. And nowhere in the book does it say you should try to stir up drama online instead. On a personal note, I do I find it sad (and very backwards) that FA:United's staff should choose to act the way they do. Dragoneer runs FA:United. At that con his fiancée runs registration. SilverAutomatic is the head of security. Cray and Zero are on staff as well. In the past week and a half they have been lambasting the Dorsai and repeatedly calling them and FurFright "unprofessional." In the conversation with Slide Wolf on Reddit SilverAutomatic rudely throws the debate aside and tells him it's "time to stop talking now" on the grounds that Slide represents FurFright and everything he says or does digs FurFright a deeper hole. Do you see where I'm going with this? If you didn't guess it, it's the staff of one con yelling at the staff of another con to "shut up, you're making your con look bad." Do as I say, not as I do. Do they think it's right to do that? Does FA:United not get feedback of any sort that the staff does anything about? I'm sure there are a few FA:United staffers who were not at FurFright or were not involved with these incidents. There are some FA:United staffers who ARE (and have been) on FurFright staff still. If they disagree with another department of the convention for their seemingly deplorable actions, should they just get up and quit staffing FA:United? I have seen it mentioned elsewhere that SlideWolf is an assistant director; his workload would at least be consistent with a full-time position, so I have adjusted that paragraph to refer to him as a "dealers' room staffer". If a 1500-attendee con hired a PROFESSIONAL security team that would get very expensive, very fast. Agreed, if you replace everyone. But just as you can bring in Dorsai at the top, you can bring in professionals. It's not likely to happen at FurFright, but Anthrocon may at some point find they are simply too large for a purely volunteer staff to work well - just as they got too big for hotels - and this will be one of the costs, like union salaries, which they absorb as the price of growth. The interesting questions to me are how long they can put it off, what positions these staff take, and how much it'll cost. It should be noted that Dragoneer and his close buddies have had a grudge against the Dorsai for a very long time. He has feuded with Giza (now a Dorsai member) several times in the past, as old PA-Furry mailing list logs should be able to attest to (if they're still available). True — though as active as Anthrocon's leaders are in the fandom, it can be hard not to have a history of some kind with them, especially when you factor in a willingness to go to bat for their friends (which is of course not unique among furs). Curiously, there was an anonymous edit (quickly reverted by curators) on the 29th to the WikiFur article about the Dorsai which removed without explanation the attribution of an earlier complaint to Dragoneer, at least in the body text. Dragoneer needs to spend more time on interpersonal and programming skills and less time sucking up to Lupine Assassin. Bright luminous yellow safety vests (can have the DI log on it still) sensible trainers, and casual (not jeans) pants would probably make the world of difference. I would be interested in hearing the feedback from the DI side, if they yelled at someone (doesn't matter who you could be the GOH, you could be Joe Public, you could just be a fur enjoying the con) not to go near a door, they were probably told not to let people go near the door and shout at anyone that did. I am unsure of the legal states in the USA but I know here in the UK those with http://www.sia.homeoffice.gov.uk/Pages/licensing.aspx SIA licenses are allowed to physically interact with you and it has to be for a I can write this down in a notebook and take it to court stating I had to do this because ... reason and if someone was standing the way of a person with limited vision (or someone wearing a fursuit say) that's possibly a reason (not a great one...) to get them out the way. I take such stories with a large dish of salt (and then have to drink lots of lolcat macros to wash the taste away.) until all the facts come out, which they rarely ever do. The politics of this whole thing is interesting, there has always been a divide between Dragoneer and Kage, on which has had much speculation but I don't even pretend to know. This whole thing just further plays into that arc. I haven't had issues with the Dorsai at AC, other then when I first entered the hotel and was flooded visually by fursuiters and stood infront of the door gawking like some idiot before being informed I was blocking the entryway. And once when I informed one that the side door to the ballroom was unlocked and people were going in there without being checked. Not to be a nark, but at the MFF dance I did see one drunken fox get kicked out for being a bit too forward with someone's mate. Bouncer kicked him out, and roos know good bouncing when they see it. I've also been to a non-Dorsai convention and noted the security was fine there too. Of course I'm never the one who winds up in need of that kind of assistance thankfully so I really don't have a bar to test them on. I'm sure that like any group, the people you get will vary from place to place. I think saying the entire Dorsai is corrupt because of what happened at FurFreight would be saying the McDonalds should close it's doors because the one you went to on the wrong side of town dropped your ice cream cone. I think Kage was being a bit overprotective here, but I think Sciggles leaking that didn't hurt him in any regard. Now the Dorsai know he was looking out for them, and trying to do it in private. If Kage had, however, used his convention database to obtain the email that's not a good thing, but people these days have their emails attached to so much it's be hard to pin it as the cause, particularly those in this fandom who people tend to know someone who knows someone. It comes as no surprise that some with grudges against AC are taking one side (particularly those who are still upset at their ban and believe in small government until they have a vendetta...), people who like it are taking another. In the end I don't think the boycott will be signed by a handful who have had problem with the Dorsai, legitimately or from their own behaviors. In the end, since FurFright is a capped convention it gives them a bit of leeway. That isn't actually in question; Kage said he used Sciggles' email address because it was the one Dragoneer (the person he was trying to reach) had used for Anthrocon registration. Honestly, I think that whole issue is something of a red herring - email isn't as intrusive as a phone call - though it's symptomatic of using corporate means for private ends. Or perhaps it isn't. After all, if you take Kage's argument to its conclusion, raising ire between furry fans and Anthrocon's chosen security staff is bad for Anthrocon. The problem arises when this is extended to "anything bad for furry fandom is bad for Anthrocon, and I know what's bad for furry fandom". This is the logic that can be used to justify misuse of power . . . but talking to someone doesn't really count. Convention security asks you to move. What do you do? B. Argue with them and cop an attitude about it so you can get your 15 minutes of e-fame. I've never had a problem with the Dorsai, but then again I don't cause trouble at conventions. Not quite. If you follow the links you'll see it's a number of things that have been complained about. Some are "breaking rules," although it seems unclear how, but other cases involve unjustified physical contact with guests and, perhaps most worryingly, an inability to correctly respond to a fire alarm. It's also not just a once-off but something which has supposedly happened for a number of years. So ... Romney or Obama? Obama seems to have this bagged at this point. Seems like Johnson just Al Gored Romney in Florida. An Obama victory means many things, many consequences. One of those many things is that Cigarskunk, Crusader Cat and Rukh Whitefang must be feeling really, really, reeaaallllyyyyy pissed right now. Is it just me or are complaints against security rising? Or si this just gettign attention cus it's Sir Dragoneer, who, lets face it is always at the center fo some controversy or others and is on a number of fur's crap list for variosu things whther FA policy, his attitude, etc. MFM had complaints about security this year, I've been invovled in issues with MFM. You have people telling other people what to do who don't believe they have the authority to tell them what to do, it gets messy. Well Neer was begging for trouble. Late night parties with loud music and the door wide open so it distributed other guests at the hotel. Being openly disrespectful towards the Dorsai. And from what I heard it was probably either Neer or one of the FA mods that pulled the fire alarm for the fun of it due to Neer being told off for blocking a fire door. In short he and most the FA staff treated the con like furaffinity and didn't care who else they were annoying. Neer was lucky he didn't get thrown out for his bad behavior. Dragoneer & his staff are bullies plain & simple. You have the most Freudian name ever.